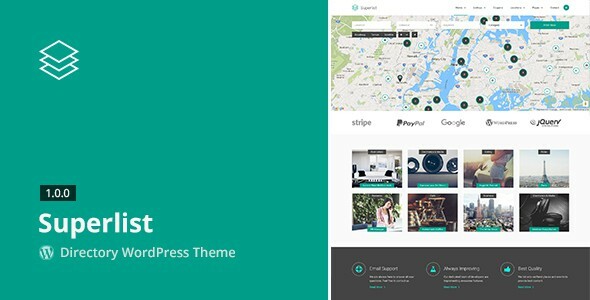 Superlist is beautifully designed premium WordPress Theme for best directory experience with all out of the box bundled plugins. With the Superlist you have complete directory solution. It comes with Plugins bundled like Claims, Coupons, Currencies, Directions, FAQ, Favorites, Google Map, Invoices, Listing Slider, Mail Templates, Notifications, Partners, PayPal, Pricing, Properties, Reviews, Statistics, Stripe, Testimonials, Watchdogs. Item Reviewed: Superlist Directory WordPress Theme 9 out of 10 based on 10 ratings. 9 user reviews.